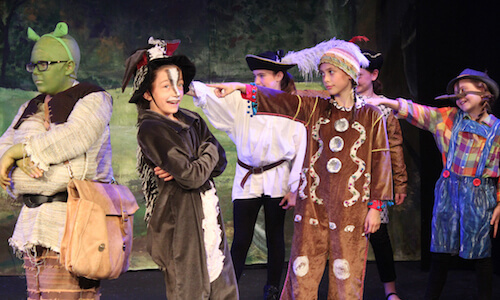 Hoboken Children’s Theater offers year-round musical theater and acting classes for ages 4 through young adult, and top-quality productions for the public at our 120-seat theater in Hoboken, New Jersey. Founded in 2002 by Chase Leyner, HCT has become one of the tri-state area’s premiere theatrical training programs for young people. HCT veterans have been accepted to the country’s top college programs in performing and theatrical arts, including majors in musical theater (U Michigan, NYU, Baldwin Wallace, Elon, CCM, BoCo), acting (DePaul, NYU, Pace), stage management (Carnegie Mellon) and costume design (UNCSA). Our students have appeared in Broadway productions, national tours, film, television, commercials and voiceovers. HCT’s producing arm is frequently asked by prominent theater writers to help develop, workshop or perform new works. One such project was our 2016 production of The Ballad of Janis Matthews and the Dodo Scouts, written by Giancarlo Rodaz and Rachel Dean, co-directed by Chase Leyner and Broadway veteran Don Brewer, and musical-directed by Scott Pearson. Getting in on the ground floor of these projects is an incredible learning experience for the organization and our performers. Over the years HCT has garnered several awards, including Hulafrog’s Most-Loved Acting Studio 2017, New Jersey Family magazine’s Top Acting Program 2015, and the Park Performing Arts Center’s Showtime Award 2009. During the academic year, our Fall, Winter, and Spring sessions offer many opportunities for students to develop their singing, dancing and acting skills. Songs & Scenes and Acting classes culminate in a presentation for family and friends during the final class. Our Sing! Dance! Act! and Performance Workshop classes put on full performances complete with costumes and sets. 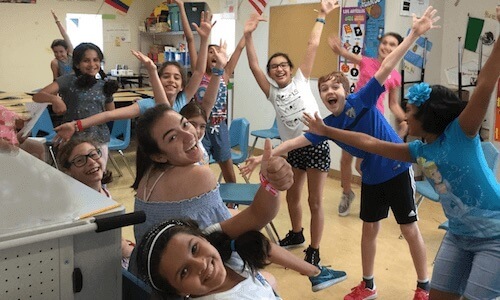 Our SummerStage program, Hoboken’s largest performing arts summer offering for children, is held each year at Hoboken Charter School and All Saints Church. Three full productions are mounted over three fun-filled weeks of rehearsals, as well as conservatory style classes in Voice, Acting, Dance and other activities. Classes are divided up by age, and we offer three week-long mini sessions for the youngest children.